GUAM — A group of 12 Japan Ground Self Defense Force soldiers and U.S. Marines look underneath and inside cars at a military checkpoint for ammunition and weapons, protecting the community from terrorists. The checkpoint is similar to those located on roads throughout Iraq, only this time the checkpoint was simulated for training purposes here Oct. 15. 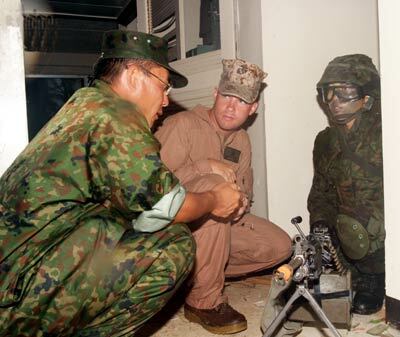 Forty-six Marines with Company G, 2nd Battalion, 3rd Marine Regiment, 3rd Marine Division, based in Kaneohe Bay, Hawaii, and 117 JGSDF soldiers from the 37th Regiment, 3rd Division, Middle Army, based in Osaka, Japan, participated in Military Operations in Urban Terrain-05, a 14-day bilateral field training exercise here Oct. 6-20. The JGSDF’s mission is to protect Japan’s people and assets from all enemies as a defensive force, but Japan’s people are moving to urban areas on many islands and coastlands of Japan, necessitating a defense force that’s capable of performing in an urban environment, according to Lt. Col. Satoru Nomura, a JGSDF bilateral training desk officer with Japan’s General Staff Office, which is the Japan equivalent of the Department of the U.S. Army. 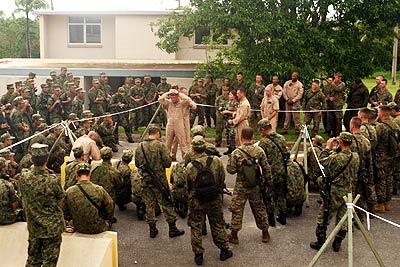 Ten Okinawa-based Special Operations Training Group instructors with III Marine Expeditionary Force taught the basic urban terrain tactics to the JGSDF soldiers and Marines. Tactical decision games, convoy operations and setting up checkpoints in an urban environment were the most important training scenarios, according to Maj. Jeffrey D. Strey, officer in charge of Special Missions Branch, SOTG, III MEF. Tactical decision games were new to the JGSDF platoon commanders. The commanders were confronted with different combat-type scenarios, such as ambushes and patrols, on a three-dimensional terrain model of an urban environment. The commanders created plans and made tactical moves using the model, Strey explained. This affected the JGSDF commanders’ decisions when they wanted to conduct convoy missions, according to Gunnery Sgt. Kenneth R. Kurre II, an SOTG anti-terrorism and force protection chief instructor. Convoys require a good plan, communication and operating procedures. Executing the plans proved to be a difficult process because of the differences in the two forces’ use of time, according to Warrant Officer Takeru Suwa, the JGSDF Liaison Officer for III MEF. The SOTG Marine instructors instilled good leadership and decision-making skills in each JGSDF soldier, Suwa explained. “The SOTG Marines taught us that everyone has to judge, think, decide and take care of their neighbors during urban combat,” Suwa said.